Give a Hurley-Byrd, Give the Very Best. Give the "Always Perfect" Gift Certificate. *Shipped to one address. Call for more details. Hurley-Byrd can easily ship your gift for delivery just before any date or dates you specify. Leave "Instructions to Seller" during checkout or complete the Gift and Gift Card Submission Form. Shipping Information: Let Hurley-Byrd Ship Your gifts. Have a whole list of nature lovers? We'll ship 1 or 20. Purchase a quantity package, send us your mailing list, we'll do the rest. Call us for mix and match packages. Many larger birds, especially woodpeckers, appreciate the extra leverage of a tail-board plus the extra weight in a tail prop feeder provides better stability for landing birds. 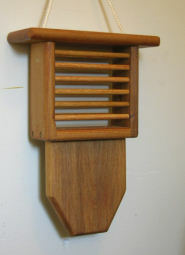 The added tail-board offers a natural feel for any bird and the larger woodpeckers gravitate to this feeder. With the tail prop's added comfort and stability, birds visit more often and stay longer. 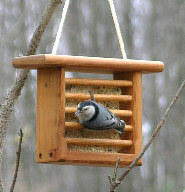 Order Our Finch Feeder Pack with 1 of Each Size. 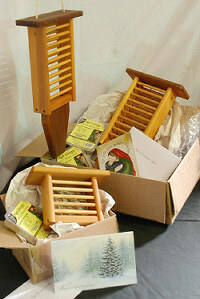 you cannot go wrong with a Hurley-Byrd Finch Feeder Gift Package, seed included. the photos to the left are of feeders crafted this month, the photos below are from six years ago. They just don't get any better! Visit our Finch Feeder Page for more details. Our #1 Small Hopper Gift 10 Years Running. If someone were to have one feeder in their yard, this is it. a favorite with many of our customers. The Titmouse feeds all the little birds from Chickadees to Cardinals. Although larger birds like the Blue Jay can feed in this feeder, they aren't comfortable and don't stay long. 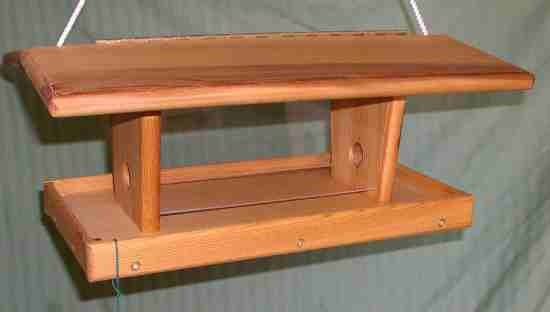 This allows your little guys to feed in a less stressed environment and you will find this feeder active all day. The Titmouse comes as a hanging feeder or add a pole mount and pole and we'll set it up correctly. Western Red Cedar - Premium Grade. Solid Brass Screws - Extremely Long Lasting. Hinged Roof - Easy Fill and Rain Protection. Are they going to different locations? Call: 877-363-0199 or write us. We will take care of it. 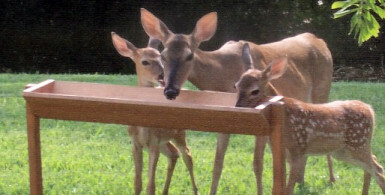 What's a Deer Feeder Gift Set, you say? 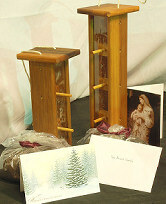 Deer Feeder Gift Sets are for people or companies needing many gifts at a low cost. more than 9 years ago. are going back in time to 2001, price wise only. offered each day of the year! With Savings of Almost 50%, We Have You Covered! Let's Step it UP! -FREE SHIPPING* TOO! The Standard was our original. Hence the name. (15 pound capacity) Deer Feeders ready for any order. 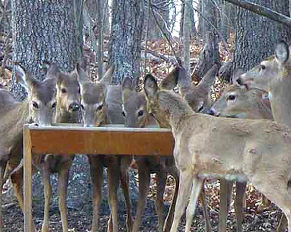 Gift the Gift of Deer Feeding this Year! Four (4) Stocking Stuffer Deer Feeders will be packaged in two ways. First: The Ultimate Deer Feeding Station. 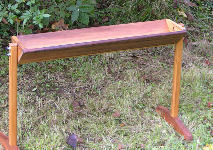 4-carriage bolts, washers and wingnuts to attach the legs to the assembled trough, 2-brass screws for attaching the feet to the legs and 2-landscaping spikes to spike the feeder into place. feeder in under 90 seconds. Second: The Gift Giving Package. All 4 feeders will be individually packaged in 4 boxes, Each will have their own instructions and separately packaged hardware. Each can be wrapped and given to friends and family. Each offer is shipped to one location for just $9.95. These ultra low priced packages cannot be shipped to different locations and our Quantity Package Shipping Special can not be applied to Deer Feeder Gift Sets.